Giving away free gifts is excellent marketing. It fosters loyalty and brand recognition. 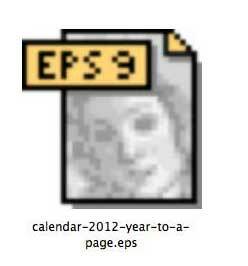 I’m giving away free 2012 calendars as PDFs. I’m also making available the InDesign and Illustrator files that were used to create the PDFs, so you can create and brand your own calendars and do the same thing, if you so wish! Branded calendars are classic marketing materials because they are the sort of thing that “hang around” for the whole year. So your logo and your marketing message will be seen for much longer than just a few days. 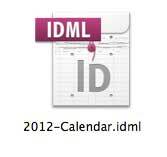 Literally thousands of visitors arrive at this site every year to download these calendars. I have two PDFs here for free download. One has the whole year on a single page and the other is a 12 page document with a month on every page. You may like to download the above PDFs by going right-click and choosing “Save as…” or “Save target as…”. 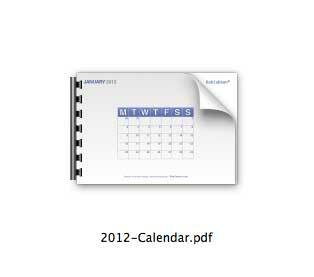 The calendar which has the whole year on one page was created in Adobe Illustrator. Here is a version in Illustrator CS5 saved as an Adobe Illustrator file (.AI) plus, for those of you with earlier versions of Illustrator, there is an EPS saved as an Illustrator 9 file. 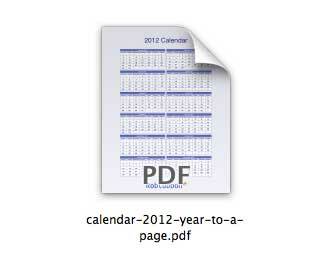 The 12 page calendar with a month to a page was created in Adobe InDesign. InDesign is a bit of a nightmare when opening in legacy versions. Firstly, I created the calendar in InDesign version CS5, I then exported this as an InDesign Mark-up Language File (IDML), then opened that in InDesign CS4 and saved a copy, before, finally, exporting from CS4 an InDesign Interchange document (INX) which can be opened in CS3. And here are the two calendars as PDFs, the two different Illustrator files and all the various InDesign files all together in a ZIP file. 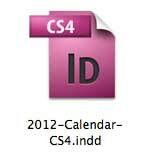 Both calendars have linked text boxes in the InDesign and Illustrator files. This means that you can use these calendars in 2013, 2014, 2015, and every year to come by just shunting the numbers on in the boxes. So if one month starts on a Monday in 2012 and a Tuesday in 2013, you can just add an extra carridge return or frame break and all the dates will move over to the correct days. 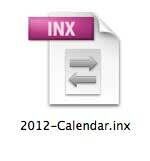 As you can see in the video linked text frames in calendars automate their creation year-on-year. I apologise to my regular readers who have seen this last year and a big “hello” to new readers who have come to this site for the first time to download these calendars. You would not believe how much traffic I get from this giveaway, which is why I do it every year. Is it a bit early to give away 2012 calendars in mid-October 2011? I don’t think so. Now is about time graphic designers get requests to do calendars for the next year. I am seeing from my Google Analytics that I’m already getting traffic from people searching for “2012 calendars to download” or such-like, so I thought it best to create them now. Thanks Rob for the video. I use InDesign once in a while and I was not aware of the ENTER button feature what you showed me here. It is very useful. So glad you found the video useful, Monika, yes, pressing Enter is much easier than going Type > Insert Break Character > Column Break on the InDesign menu! I am very happy because I saw first time of you site. You are great sir, I Love you sir. I learnt very easy to prepare calenders. I want to learn to you. I love this… this is so super helpful! Thank you so much! This has been the hugest time saver and I learned a great tip about text box linking. Again thank you! Hey, Sam, I do like a happy visitor! Just wanted to let you know that November has 31 days, at least in the illustrator calendar. Still better than having to build it myself, great job. Correction. The carry over days from November in the December calendar. Hello Brian. I’m not with you. November 2012 starts on a Thursday and ends on a Friday – and has 30 days as usual. I’ve just checked all the files and I can’t see an error. Could you let me know? Ok, I figured out what you did. You must have counted backward on the extra November days in the Decemeber Illustrator calendar. It ends in 31 instead of 30. The starting date for December is correct. Ah, I’m with you now, Brian. I was looking at the dates for each month not the tinted “carry over” days. I had indeed made a mistake with the November “carry over” days in December of the one page Illustrator one. All versions (AI, EPS and PDF) are now updated. Thanks, Buddy! Glad to help, Jawad. Can I have an elephant, please? Thanks so much for these templates! I really appreciate your generosity! Thanks, you made my life easier. Any one has 2013 calendar? 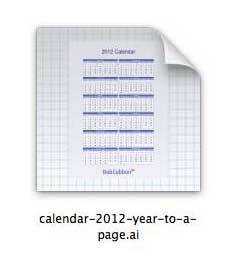 You can use these calendars to create a 2013 version very easily, Anonymous. I’ll do the 2013 versions in September. Thank you very much for the calendar! Thank you, brother, I’m glad you’re Happy.